Do You Know the Way to Guerneville? Preferably on the non-winding Russian River road, as Californian's DON'T likes us holding 'Dem up in our tipsy-whipsy Minivan; Hya! As leave I-T to two OLD White Guys crusin' California in a Minivan; YIKES! Back in our trusty Dodge Caravan, as we rolled onto Pitlane, Claudio spotted a parked Semi Big Rig' with the words Canadian Trucking emblazoned in Gynormous letters, to which he stopped at the cab, where two Gentlemen were entering said vehicle. Rolling down his window, Claudio' wise-cracked: Uze Guys from 'KanaDuh? Hya! And then I quickly added "Take Off Hosers!" To which Claudio repeated to the drivers who were totally perplexed - having NO idea what a Hoser was? To which Claudio said I guess that's just in the movies, informing the two men they needed to watch 'Kuhnadiun Bacon 'bout two or three times before we bidded them a fond Adieu. Then somewhere further down the Highway, Claudio informed me that they were Sikh's! To which I quickly retorted, well Uh Duh! Naturally they wouldn't know what the HELL a Hoser was, so thanks a lot Claudio; Hya! To which he'd further elaborate that the fine gentleman who'd assisted me in the lavatory was one of the two truck drivers. Then we were lost again the following morning when going to the track. Like which way do we go Tomaso; HWY 37 West or East? Having NO idea which way we were traveling I simply told him the direction we'd taken yesterday, which was west on Highway 37, which I'd remembered went to the track nearly two decades later, unawares that we were coming into Sonoma Raceway from a totally different direction: CRIKEYS! Then Claudio pronounce: Think we'd better stop 'N ask for directions, doing so at a nearby gas station. Alas, a super nice, friendly young black gentleman said; I'm going right past the track. Do you want to follow me? Otay, when I hit my flashers, then that'll be when you'll want to turn into the track's entrance. And then pulling over errantly, Claudio mused out loud; Hey! He waited for us, those were his brake lights instead! And then the 'lil Honda Civics' flashers flashed and we turned right into the Sonoma Raceway entrance; Unbelievable! As everywhere we went, people took pity upon us 'N gladly gave us directions wherever; how FREAKIN' kOOL! 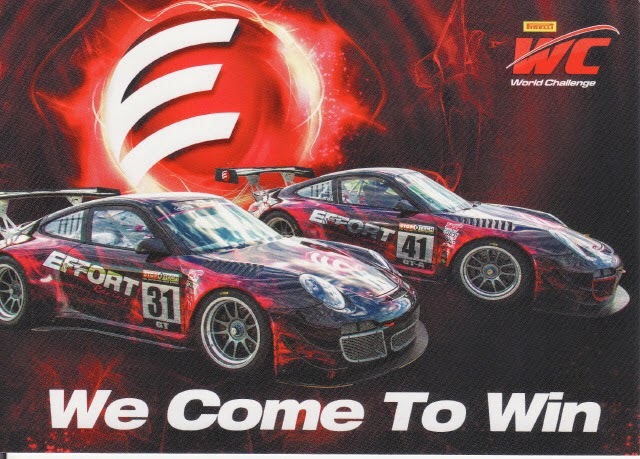 Thus returning to Sonoma Raceway, which for Mwah, will always indelibly be known as Sears Point Raceway, we arrived somewhat bright 'N early for the first of two GURR-REAT!!! Dazes at this ultra Groovy, Twisty' racetrack. 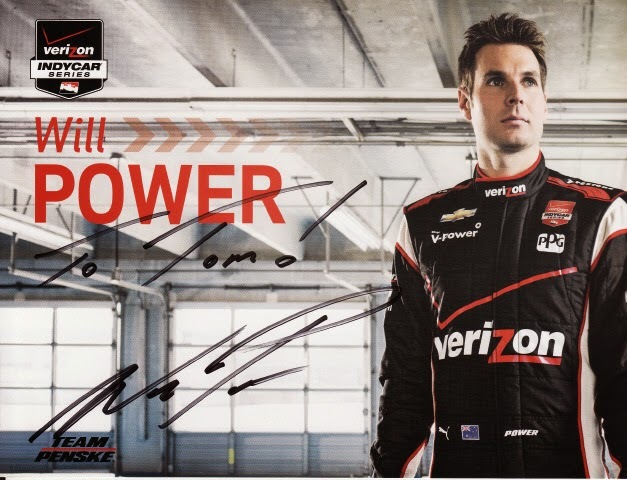 As I think we arrived sometime during the morning feeder-series warm-up sessions, recalling now catching the majority of the Indy Lights before Claudio' casually asked: Do you wanna get Will Power's autograph? Yeah, hence we left our seats along Pitlane around 11AM for the IndyCar Fan Village - with NO clue where the autographing was being done. The autograph session started at 11:15AM and as we stood in a pretty Mondo' line of admirers and time ticked away without any movement in the line, I thought to myself for sure we'd never make it. Schlepping forwards very slowly, whilst Claudio read to me what drivers he could see, upon saying who's the #20, to which I calmly replied Mike Conway, the friendly man alongside us from Colorado said: You certainly know your stuff! To which Claudio said; that's his job; Hooah! Hey Tomaso, I think we're gonna make I-T! 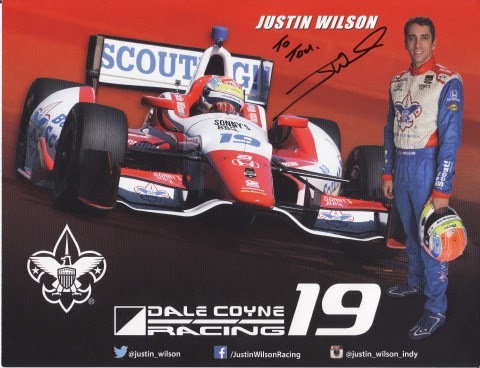 Justin Wilson & Carlos Huertas, Mike Conway, Simon Pagenaud & Mikhail Aleshin, Joseph Newgarden, Jack Hawksworth, Graham Rahal plus Juan Pablo Montoya, Helio Castroneves & Will Power. Dale Coyne Racing, Ed Carpenter Racing, Schmidt Peterson Hamilton Motorsports, Brian Herta Autosports, Rahal Letterman Lanigan Racing and Team Penske. Next up, Claudio asked his teammate where U from? As Carlos Huertas politely replied Columbia... Mike "Ice-Ice, Baby!" Conway was his usual Chillin' kOOL self before Claudio got a wry smile outta the Rooskie' Mikhail Aleshin over his excellent (Russian) ambassadorship, while "simone Pagenoe" (Simon Pagenaud) was his usual bubbly, friendly self! Think we got a grunt outta Bloody 'Union Jack (Hawksworth) whilst I don't even recall greeting Joseph STUD! Newgarden, but know he'd have been great! Since I only discovered this upon returning 'N reviewing my cache 'O "Hero Cards." Then it was time to meet the trio I'd been looking forward to, the sole reason I'd opted for doing the autograph thingy was to finally obtain DJ WillyP's scrawl; 'Whale, actually just two-thirds of I-T, since 'HULIO simply makes my stomach turn! As contrary to popular belief, JPM (Montoya) was hands down the coolest and most charismatic with us, as Juan was smiling, relaxed, happy, laughing and joked around with us! While 'HULIO (Castroneves) sat completely stoic, like maybe I wouldn't S-E-E him? Before Claudio said here's Will Power! Who also wouldn't speak to Mwah until I said: Hey Will, BEAT this guy next to you! To which he politely said "I'm trying to man!" To which afterwards, Claudio informed me that Power looked completely BORED! And I won't bust-up too heavily upon these drivers, who I know get pulled six ways at once by everybody who wants to be their best friend, and will give them the benefit of the doubt that they didn't S-E-E my white cane; BUT! C'mon Guys lighten up, as I purposely didn't say anything to 'HULIO 'cause Y'all know your Mum's saying 'bout if you've got NOTHING good to say... Yet overall, it was a very enjoyable experience 'N far better than my initial Champ Car outing 'Wayback in 'Twenty-oh-Six, so way to go IndyCar! As Karmically! 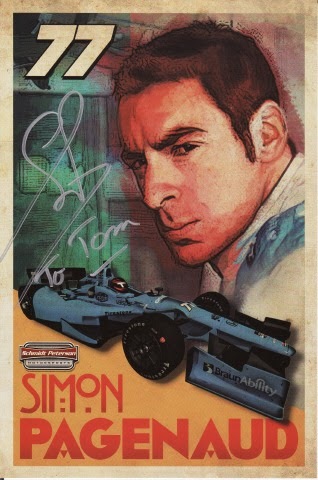 I ended up getting A-L-L 3 of my most favourite IndyCar driver's autographs, i.e. ; Justin Wilson, Will Power & Simon Pagenaud! Although I'm also smitten with Joseph Newgarden, so it was a memorable haul! Still in the happy afterglow of collecting half of the Indy Cars field's "John Hancock's" and with smile on face, I told Claudio, Mission Accomplished; Thanxs dude! Thus, we decided to next work our way up to Turn-7 for a different vantage point. And a la Circuit Of The Americas, (COTA) I'm partially compelled to write Sonoma Raceways a letter regarding how wonderful A-L-L of the myriad of bus drivers, Shuttle (golf cart) drivers and ground staff were in regards to assisting a legally blind race aficionado! As they really treated the ADA requirements perfectly and were a pleasure to be served by all weekend long! As about my only complaint for the entire weekend, and I'm NOT politickin' for any changes, but! the Turn-7 backside of track complex seemed woefully inadequate in regards to providing any fan amenities, i.e. ; there being NO video screens or loudspeakers to help keep us informed of the On-track happenings, while who knows where the nearest bathrooms are? Although there was one lone PA System some where's far behind us, nevertheless, I could barely hear I-T over the cacophony 'O racing machines... As I had ZERO idea how far the track dropped away, until we walked down 'N down row after row of concrete block seating to the lowest allowable vantage point at Turn-7, where I could finally S-E-E tiny specks 'O colour when the IndyCar's turned thru the corner! So I really didn't know what happened during the first Indy Lights race, and couldn't hear the results... Which would take until Sunday to discover that Jack Harvey had walked I-T! (Saturday) With NO mention of Gabby Chaves or Zack Veach; Hmm? Wonder what's up with the championship battle. Meanwhile, with NO offense towards the Pro Mazda drivers, nevertheless, we skipped their race in order to run to the Loo' and grab some Team Caddy' Swag; Uhm? This isn't supposed to be your Pappy's Caddy; Hooah! As Claudio informed me I was getting a Cadillac Racing T-Shirt; Kapishe! Now, I know the nice young lady was only doing her job, after being informed I couldn't fill out the computer questionnaire - since I couldn't S-E-E IT! Uhm? Shouldn't that have raised some Red-flags right there. But it got even more Wacky 'N Wackier; Err FUNNY! As the first Questione she asked me was What type of car do you drive? As I stood there with white cane in hand, a smirk began sprouting upon my face... Replying, a 1978 Ford Econoliner, naturally! Going back to the "Stands," as the seats are simply long, hard and warm blocks 'O concrete Up 'Thar in 'Dem Hills of Turn-7, returning Justin'time' for the days Pirelli World Challenge race, moments later Claudio returned saying hurry! Hence, I was quickly escorted around the corner's bend toot sweet where Claudio positioned me in front of the fence where all of the various World Challenge participant's in their respective mounts were waiting to go On-track in their different classes, as the row of NASTY, rumblin' Ford Mustang BOSS's amongst others sat idling angrily while a lone Dodge Viper drove by, and then I just stood there stupefied when the BAD ARSE BOSS 302R-S dumped their clutches and rolled off onto the racing surface! Back to our seats for a very entertaining race consisting of several different classes, with 44-cars in all, as I managed to catch one name from the past as the starting grid was read out from over yonder. Being the name of ex-Trans Am competitor Jack Baldwin, who I believe was driving the Audi R8? And with the Tintops' larger silhouettes, I could see their various rainbow 'O colours the most vividly, albeit they were still just specs 'O colour to Mwah, along with their varying mechanical tones, as I'd later be told that the two nastiest, barking, growling V-8's were the Caddy's, as I was completely dumbfounded when Claudio pronounced how the two Cadillac's had just been passed by a Kia in the corner! Yep, you read that right, a FREAKIN' Kia was outperforming the Caddy's, although they re-passed the belligerent Kia the following lap... But really, finding out that one of the Cadillac CTSV Coupe's chauffer's was the talented "Johnny 'O," (O'Connell) a longtime GM Factory driver, most notably for those all conquering Corvette's, what gives? Then Claudio drifted off to talk to somebody seated below us, as it turned out that the ultra BAD ARSE #17 "FoMoCo" Boss (302R) Stang was being piloted by her Grandson. As it turned out that many of the teams and their supporters were seated around us during the race. Next, it was time for the Big Dawgs' IndyCar Fast Six Qualifying session, as we were chagrined to see Montoya not advancing into Round-2; WTF? As I explained the qualifying format as Claudio called out the various car numbers for Mwah. Having gotten up to give our Bums a respite from the uninviting concrete slabs; Err seats during a break between Qualie sessions, we went back down towards our previous vantage point where we'd watched the ground shaking challenge cars depart from, making a beeline for the "Honey Buckets" before quickly walking a little ways back in-between the two areas. 'Thar, we decided to witness the Fast-6 Qualie' Shootout by standing at the end of the track's straightaway w/Will Power & Co heading straight at us! As Power scored his 35th Pole, and he looked untouchable for the next day's race! Afterwards, we walked around the World Challenge pits, where unquestionably, my Numero Uno racecar was the 'Ultra BAD ARSE McLaren MP4-12C GT3! And to boot, there were three of these exquisite racers on hand parked Arse-over Teakettle, with their respective Derriere's sticking out a la Le Mans style.. As there's NOTHING wrong with my eyesight as I accidently smacked my hand on what we deemed to be the "lunch-tray," the obligatory rear spoiler that all cars seemed to be running, when excitingly trying to point out something upon them to Claudio; YIKES! Then we chatted with a very nice couple from Georgia, Me Thinks? As they were racing a Porsche Cayman S which I thought they said had won its class. Funny how it seemed like such a tiny racecar. And if Y'all think playin' "Follow duh Bouncin' Ball" in regards to the four separate Tudor United Sports Car Championship classes, then try figuring out World Challenge's SIX! As it took me forever to find what category the Cayman's were contesting, as even funnier yet, Jack Baldwin was listed as the driver of the #73 Porsche Cayman S in the GTS class, which most likely is my favourite since its where the BOSS 302 R's reside! As I'm a 'Wee bit 'Cornfuzed since apparently there's six Driver's classes, i.e. ; GT, GTA, GTS, TC, TCA and TCB for competitors to choose from in the Showroom Stock derived classes. Next, we had to check out the #17, as I marveled over how BEEFY' the modern day Ford Mustang BOSS 302 R looks! And they seem to be pretty popular with the competitors, as I know I heard multiple entrants listed over the far away PA system - when the track was still relatively quiet before the World Challenge Storm! And the other car that attracted my Attenzione to this SCCA sanctioned series is the Bentley, as a pair of Continental GT3's are being campaigned for the factory by Dyson Racing under the Team Bentley banner, with vastly experienced Sports Car Drivers Butch Leitzinger and Guy Smith. While there was a beautiful Lamborgenie' (Lamborghini) Gallardo parked all by its lonesome, as NO idea if this was ex-Formula 1 and Indy Racing League driver Tomas Enge's mount? While another name from the past I recognize is Tommy Drisi's, who's an ex-Trans Am and factory Corvette driver now apparently running his own Aston Martin GT3 in the BIG DAWGS' GT class. Which features the likes of Jonny O'Connell's Cadillac, CTSV, Butch Leitzinger's Bentley GT3, Alex Figge's McLaren MP4-12C, Audi R8's, Ferrari 458 Italia GT3R, etc. As not sure what Aston Martin team it was? Probably one of the Vantage runners, perhaps; as Claudio reported that one of the Aston Martin crew members told him that the cars are insured. All crumpled/wrecked bodywork, etc is weighed, scrapped and the team then re-inbursed. With the engine coming sealed directly from Aston's factory 'N it's a big NO-NO to tamper with them! For the "riveting" conclusion, see; The Tomaso Files: Buddy,Peter and Eleven 'lil Dozen IndyCar boyz - Fini!